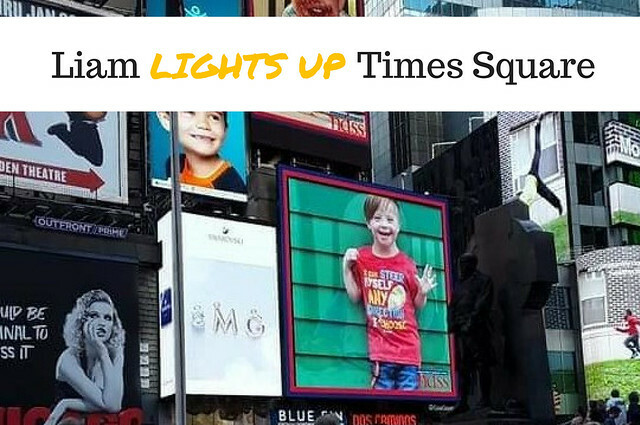 Liam first appeared in the NDSS Times Square Video in 2015. We were so excited, but we were unable to attend at the time. A sweet friend snapped a picture for us, and we are incredibly grateful to have it! Since then, I forgot to submit a picture each year for consideration. This year, however, I managed to submit one JUST before the deadline. The NDSS only chooses a handful of submissions, and we were so excited to hear that his photo was chosen again! 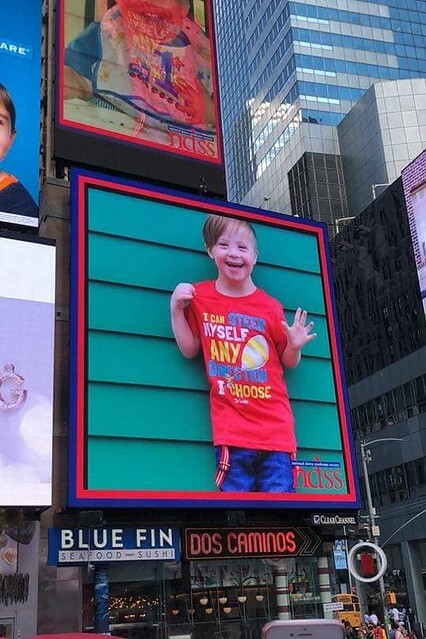 Liam's friend since infancy, and current Kindergarten classmate, who is also rocking an extra chromosome, was also chosen for the NDSS Times Square Video! 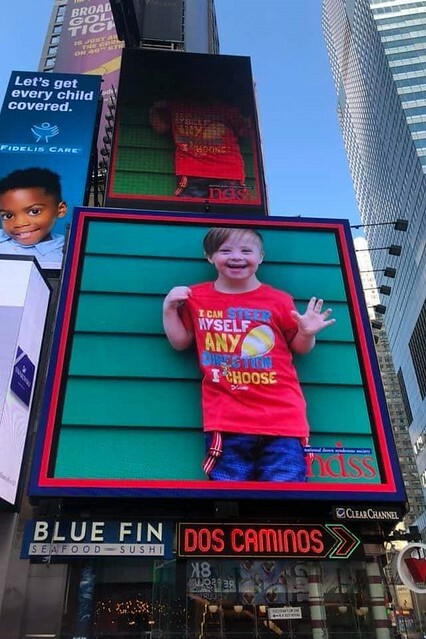 Prior to the actual event, our county newspaper and local newspaper, wrote a full page article on Liam, his friend, life with Down syndrome, and the upcoming Times Square video. Liam's picture even landed on the front page! It was so wonderful to be able to share just how positive, happy, and normal life with Down syndrome is for our family! Initially we had planned to attend the event in New York City on Saturday, but unexpected life circumstances popped up, and we were unable to travel. I was devastated that we would be missing it in person yet again, and spent the days leading up to it in a funk. But as I mentioned, my rockin' mom tribe went above and beyond, and sent so many great pictures our way! I always tell people how amazing the Down syndrome community can be, and it's absolutely true! I've met many moms locally, along with a few of my favorite out of state moms at conventions. 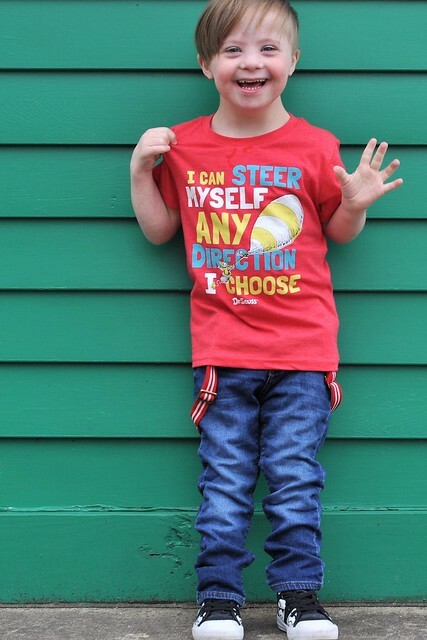 I interact with hundreds of moms daily, I volunteer each day for the Down Syndrome Diagnosis Network, I regularly share about what life with Down syndrome is really like, and I am actively involved in the Down syndrome community. I consider many of the moms I've never even met in person my friends, and I can't wait to really meet them one day and give them a huge hug for the endless love and support they give to me and my family each day! One day the planets will align and life will cooperate, and I will finally be able to attend a rockin' mom retreat, and the NDSS Times Square Video Presentation, if Liam is chosen again. For now, I'm counting down the days until I can finally meet a few of my favorite moms at the NDSC Convention in June! 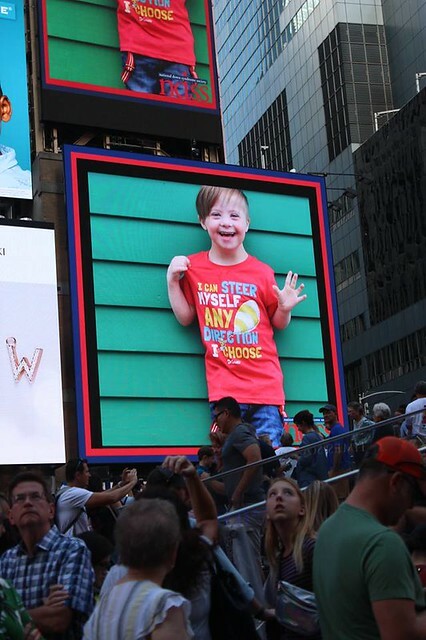 I am so thankful to all the rockin' moms who went above and beyond on Saturday, and snapped a picture for me of Liam's incredible smile lighting up Times Square. It truly made my day, and their kindness brought me to tears. 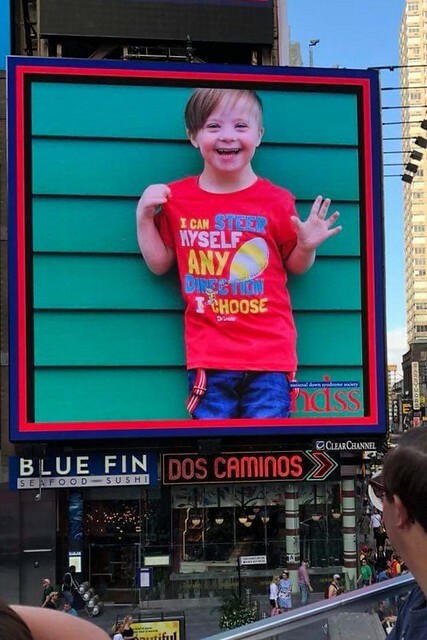 THAT'S the power of the Down syndrome community! We couldn't be there in person, but the moment was captured perfectly for us! This is so incredible! I'm glad some folks were able to capture the moment for you. Have a wonderful week! So awesome!! I'm glad you were able to watch live and get so many photos from friends!! This is truly amazing!!! 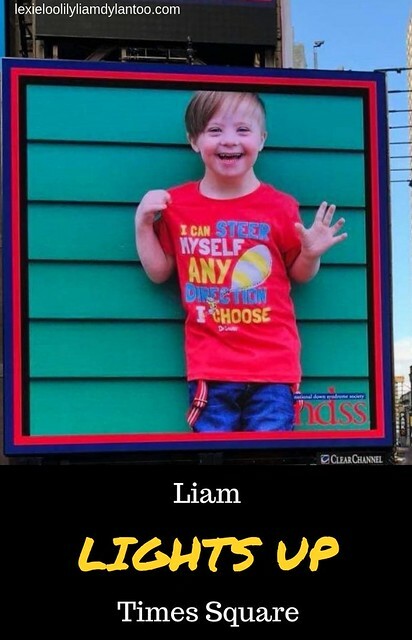 I know Liam's sweet face lit up the lives of so many that saw it on that day. He just emits true and pure joy!! So great that you had a tribe send you pictures. I love that!! Also, you are an amazing Mama!! I'm so sorry y'all had to miss it again, but I'm so glad that someone was able to capture the moment for you. That is just so neat that he was chosen! He's famous!! Go Liam! That is the BEST picture! His shirt says it all. Aw, I love the photo that was used, and I'm so sorry you couldn't make it again. One day! It's great you have some amazing mom friends that were able to get lots of pictures for you though. How awesome is this! Look at all of that love from all of those Mamas!!! Go Liam!!! You rocked it, buddy!!! I love this. 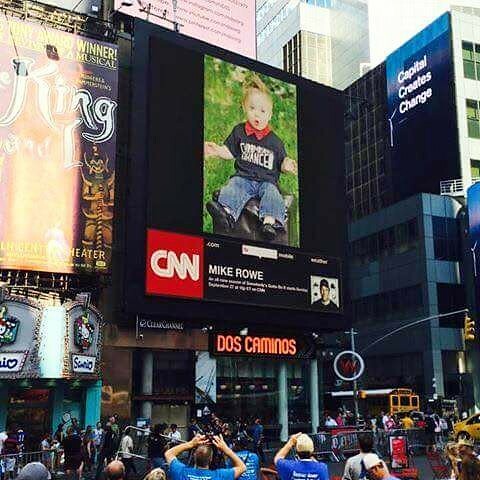 I am sooo happy he was up in Times Square again. I love seeing his smiling face! That is so cool! He is adorable!